By the 23rd Century, colony ship technology has allowed the human race to spread itself across the stars. Massive resource exploitation efforts have allowed for corporate concerns to extend all the way from Earth to the farthest reaches of known space. On the frontier worlds brave men and women eke out a meager existence in the name of human progress – and human profit. There is a lucrative trade in exotic substances found on distant worlds, artifact remnants of dead alien civilizations, and strange life forms of otherworldly origin – all of which, of course, is illegal under Terran Confederation law. Frequent border disputes and civil conflict mean there is no shortage of mercenary work in the sector. Scuffles between Terran Confederation colonists and planetary natives often turn violent. In 23rd Century, the people are represented by two separate yet equally important groups: the peacekeeping force that investigates crime and the local magistrates who prosecute the offenders. These are their stories. You awake in a warm place, bathed in an unknown radiant heat. You are face down in some kind of soft material. It feels really good. And it smells… like fabric softener. Like home. What could it possibly be? You reach out a hand and roll over to try and get some perspective on the situation. Terror grips your heart as you plummet through empty air, and you descend into a hell without meaning or end. What happened to the warm place? The soft place? Sweet merciful lord, you’re going to die! A hard rap on the head brings you back to reality, and you remember where you are: in your Senior Wing cabin at the Solar Ranger Academy, where you’ve lived for the past year. And today, at 0800 hours, they’re handing out the final assignments for graduation. You check the atomic timepiece on the wall. Uh oh. You’re going to be late. Post actions in green italics. Time to put on our Solar Ranger Corps standard issue form fitting steel blue Jumpsuit and find our way to final assignments! Dwarmin's fell gaze has fallen upon you. Sadly, Your life and your quest end here, at this sig. "The hats never coming off." embroidered on the left pocket. As Captain Bear watches you with his judging eyes, you fling your pyjamas into the laundry hamper and shrug into your jumpsuit, finding time to put on your uniform boots as well. A slap on the door's activation switch and you're heading out. The assignments are taking place in briefing room 3, in the south wing, and you make your way there at a brisk pace. The halls seem otherwise empty, which is why you don't notice the other occupant of the walkway until it's too late. With a smack, both you and he land flat on your bums. The man gets to his feet in a fury. You recognize him - it's RANGER CAPTAIN STOLLER. "Cadet, you are supposed to have eyes," he bellows. "What is your name?" Best to answer promptly. Stoller's known as a hardcase. "Cadet Kathryn Thrace Aran, sorry sir, my fault sir. I should have used my eyes." "Cadet Kathryn Thrace Aran," you say promptly. "Sorry sir, my fault sir. I should have used my eyes." Stoller regards you with set jaw. "Cadet Aran, is it? You're a member of this year's graduating batch." He glances down at his timepiece. "Young lady, you were supposed to be at BR 3 ten minutes ago. This dilly-dallying is unbecoming of an officer and gentleman of the S.R.C.! I suggest you sashay your way down there this very instant, unless you're too busy subjecting your senior officers to various indignities." Without a further word, he spins on his heel and strides off. Unusually lenient of him. Best to get sashaying then, while being grateful at our good luck and concluding that today's gonna be a good day. Indeed, make our way down to BR 3! Since we're already late, we'll need to make a good entrance-calm, collected, cool. 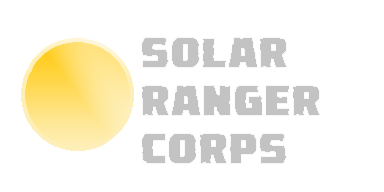 The three C's of the Solar Ranger Handbook! As the Captain stalks off, you waste no time. A few minutes of calm, collected, and cool sashaying* later, you find your way to briefing room 3. You take a brief glimpse out of a window as you pass. The sunlight reflecting off Mercury far below is dazzling, but a beautiful sight nonetheless. Today is going to be a good day. Cycle. Whatever. As quietly as possible, you push BR 3's door open and attempt to sneak into the room unnoticed. A sharp tug on one of your jumpsuit's sleeves makes it apparent that you've failed to do so. "Where have you been? You can't afford to miss something important like this." You turn to see CADET ALICE TAKAHASHI, fellow senior and your best friend. She looks slightly miffed. Quietly and politely inform our friend Alice that we knocked back one too many 'Purple Martians' last night during pre-graduation festivities, and overslept. "It was all those Purple Martians I drank last night," you whisper back to Alice. "Cadet Bradley's party? Remember?" "Remember?" she hisses. "I wasn't even there! I can't believe you got drunk the day before the most important moment of our lives." Before Alice can continue chastising you for your irresponsible behaviour, Lieutenant Turner calls for attention with a sharp rap of her baton on the desk. "Alright!" she says. "For the next three assignments, I'm going to do something a little unprecedented and ask for volunteers. Squad 9 under Lieutenant Corr is filled out, but missing a Marksman. Squad 10 under Lieutenant Brimley is filled out, but missing a Pilot. Squad 11 under myself is filled out but - you guessed it! - missing a Scout. Can I get some volunteers to fill these positions?" What was it you were good at again? Why not play to my strengths? No one beats me on the laser grid sprint and jump track-I won the enhanced Gravity free climbing finals last week (even if my greatest rival, Cadet Sally Winters, hit me with the penalty sphere)-I even took the survival challenge on the Holo-deck and got the highest score on Jungle Of Jupiter, 1,920,002. I'm a born survivalist, a natural hunter-the ultimate predator! Anyway, I'm going to volunteer for the Scout position. So there.